ER Hurricane/Tornado Survival Kit selected best emergency kit for severe weather by Business Insider. Why you'll love it: When a storm drops buckets of rain on your home, you'll be glad you have ER Emergency's waterproof bucket filled with all the supplies you need to ride out the storm. The ER Emergency Ready Tornado/Hurricane Survival Kit is designed to help people safely shelter in place during a serious weather event. For an area prone to wild fires or earthquakes, get yourself a backpack emergency kit. If the natural disaster most likely to ravage your hometown is a hurricane, flood, or some other event involving a whole lot of water, though, then this is the kit for you. 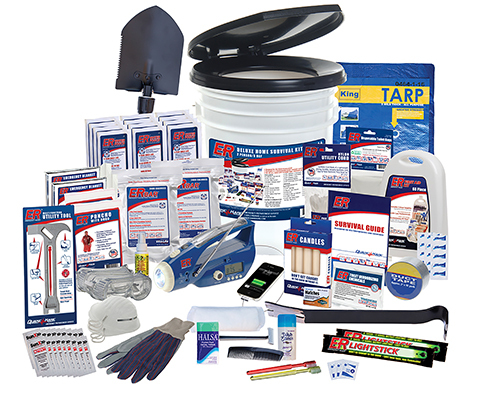 The ER Emergency Ready Tornado/Hurricane Survival Kit packs all of its supplies into a rugged and watertight bucket, so even if your home is flooded, your survival gear won't be damaged. Along with the gear you'd expect in any good emergency prep kit, like first aid supplies, a flashlight, and some rations, this kit also has several tools that will become of paramount important during severe storms. These include a utility shutoff tool that can help you turn off an at-risk or ruptured gas line or water pipe, a crowbar that could help force a damage or swollen door or window, and work gloves and face masks that can help keep you safe in unsanitary conditions. What's missing here, though, is a good fire-starting tool. ER Emergency Ready included decent matches, but those will run out in time, so toss in a fire starter kit of your own for good measure. A buyer named Jerry says that the ER Emergency Ready Tornado/Hurricane Survival Kit has "everything you need to survive for a few days," and he speaks for many emergency preparedness kit owners when he adds that he "hopes [he] never needs it!" In an article from PrepareMag, a reviewer called this kit "effective and reliable" for use surviving during both "man-made and natural catastrophes."